Wow, it's been an entire year since I did a monthly spending recap! How did that happen? Nothing, really. Our utility bills have been dropping incrementally as the weather warms up, a trend which I expect to continue until it gets so hot we have to turn the air on. We've got some dental bills coming up for both of us, and our grocery spending has gone up a bit more in general (hey, having a kid actually does cost money! ), but otherwise this was a pretty solid month. Even having spent $700 on a mattress, we'll be able to transfer some $$$ to savings to bulk up the emergency fund - yeah! 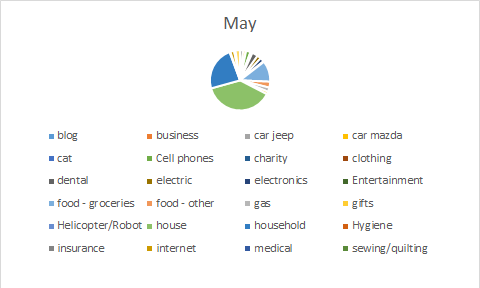 How was your May spending?